Back today with another delicious option that works equally well for meal prep or a weekend brunch. 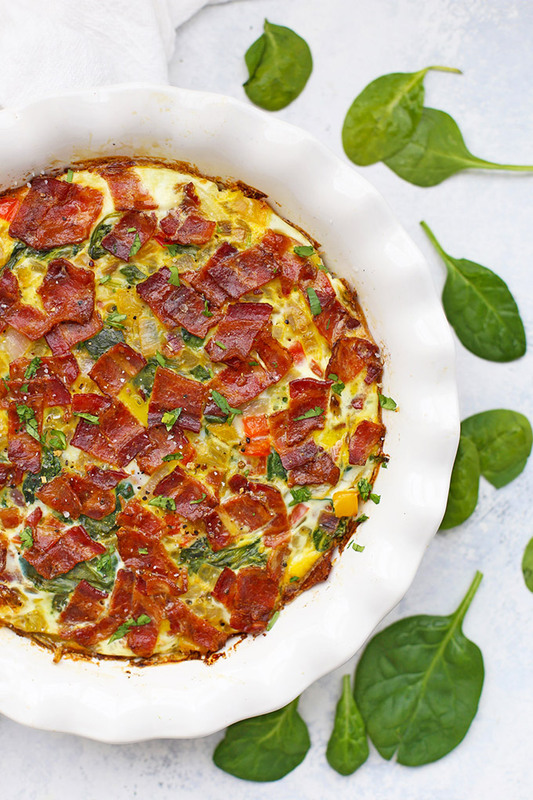 This green chile frittata is easily the star of the show. It’s savory, packed with veggies, and has several layers of flavor, thanks to perfectly cooked veggies, a little kick from the green chiles, and some smoky bacon to top things off. Plus, the leftovers reheat like a dream, so it works equally well for meal prep! Let’s jump in! We start with a base layer of frozen hash browns. 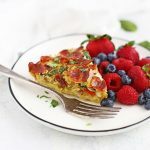 They “anchor” this dish almost like a crust, but they blend right into the egg frittata, helping it be substantial and filling without weighing it down. Sprouts is running their big 20% off frozen sale this month in celebration of Frozen Foods Month, so it’s a perfect time to stock up on all your frozen favorites, whether that’s Cascadian Farms Organic Hash Browns I used for this frittata, stir fry veggies for dinner, cauliflower rice for an easy burrito bowl, frozen fruit for smoothies, parfaits, and more, or any of your other favorites! Next, we layer a vibrant mix of veggies–sautéed onion and bell peppers give a great base layer of flavor. Add in a heaping amount of spinach (which cooks WAY down), and mix in some green chiles for a little flavor boost, then top the whole thing with some crisp, crumbled bacon. Need I say more? Paleo Notes. If you’re eating paleo or avoiding too many carbs, you can totally swap the frozen potatoes for frozen cauliflower rice (Cascadian Farms makes a great one) or you could swap in shredded zucchini. Just be sure to wring out the extra liquid before adding it to your baking dish. Pump Up the Veggies. I love that a recipe like this can be adapted so many ways. Feel free to try different veggies in this. You could add some sautéed mushrooms, shredded zucchini, or even some diced tomatoes. Dairy Free (or Not!) – This recipe is naturally dairy free as written. I use unsweetened cashew milk, which I find has the most neutral flavor of the nondairy milks (just be sure you don’t pick up the vanilla!). 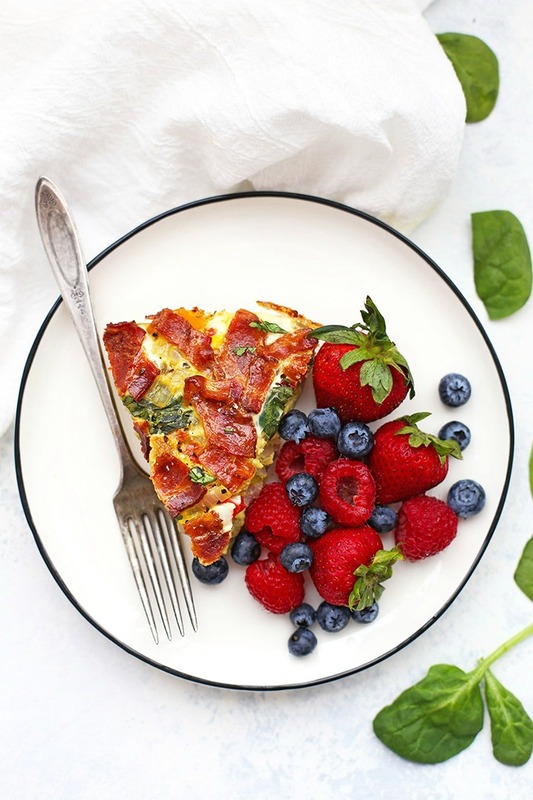 If you tolerate or enjoy dairy, you can absolutely use dairy milk, or top this with a layer of cheese–Pepper Jack or sharp cheddar would be terrific!. Storing & Reheating – I store this in the refrigerator for 3-4 days (we always finish it!). It’s easy to reheat individual servings in the microwave, or if you are reheating the whole thing, you can put it in the oven at 350 degrees for 10-15 minutes, or till it heats through. Say hello to big time flavor without a lot of effort! 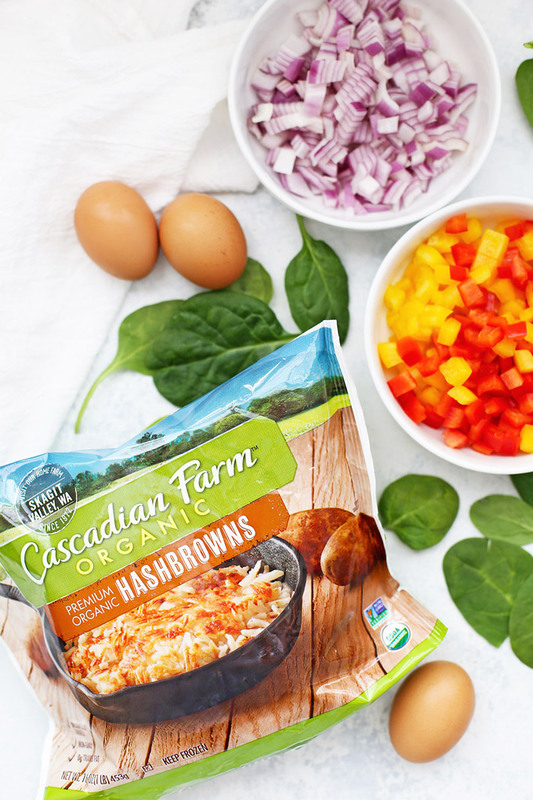 This frittata is packed with veggie goodness, hash browns, and bacon. 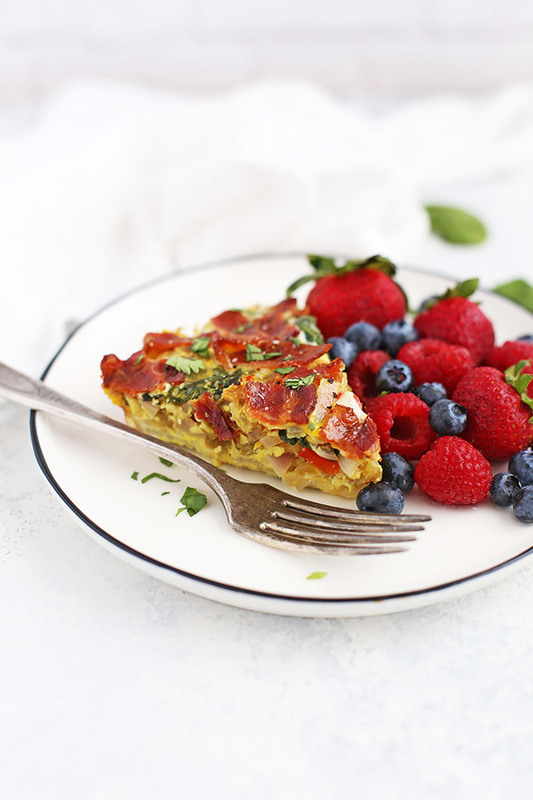 It’s an all-in-one breakfast dish that’ll make any morning better! 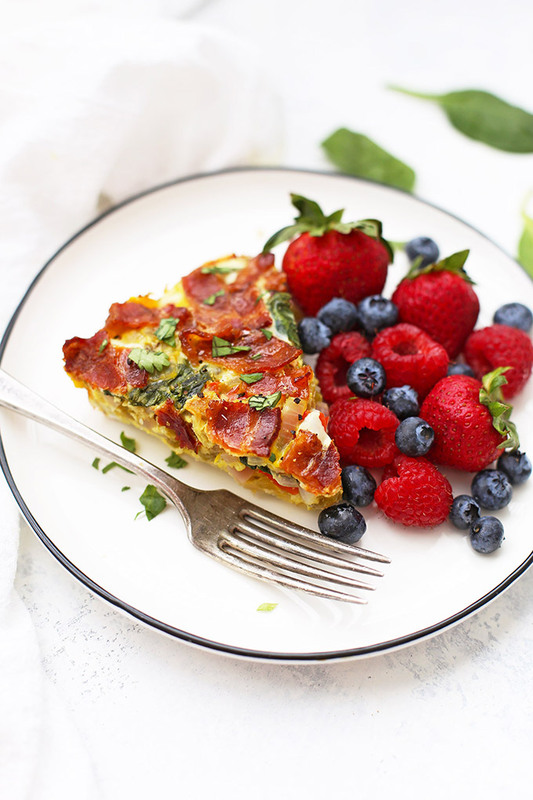 Perfect for meal prep or a weekend brunch. Preheat oven to 375 degrees F. Grease a 9 inch pie dish (or 8×8 baking dish) with nonstick spray, or a little olive oil or butter. In a medium sauté pan, heat olive oil over medium heat. Add onion and bell pepper and sauté over medium heat 8-10 minutes, or until very tender and onion is translucent. Add green chiles, spinach, salt, and pepper, and stir until spinach is wilted. Bake at 375 degrees 30-35 minutes, or until center is just set. If the edges are browning faster than you like, you can cover the pan with foil to protect it from browning any more. Let cool slightly before slicing and serving. Garnish with cilantro, as desired. Storing & Reheating – I store this in the refrigerator for 3-4 days (it never lasts much longer!). It’s easy to reheat individual servings in the microwave, or if you are reheating the whole thing, you can put it in the oven at 350 degrees for 10-15 minutes, or till it heats through. I’m excited to make this simple brunch entree for Easter weekend. Did you add more bacon on top of egg mixture before you cooked? Or just out of oven? Thanks for the recipe! Just discovered your site and I’m excited to explore.